NCS is one of the few copper smelter in the world whose highly polluting process is not monitored and puts at high risk water resources, workers and residents' lives and the area's biodiversity. The Namibian Custom Smelter (NCS) is one of the few smelter in the world to treat concentrated copper. The blister copper is processed to copper metal in European and Asian refineries, the arsenic trioxide is sold worldwide for wood treatment and pesticide chemicals production. However, the production process is highly polluting due to its release of arsenic trioxide, among other hazardous waste. Today, the global demand for the former is shrinking. As a result, the arsenic dust waste is piling up in sugar bags, a few meters away from the first houses of Tsumeb town. In 2010, the smelter was aquired by Dundee Precious Metals (DPM). The terms of the transaction granted DPM with no accountability for the smelter's previous impacts under the former owners. The Canadian company received money from the European Bank of Reconstruction and Development in 2012 to increase the ore recovery of its mine Chelopech, in Bulgarian. Half of the copper smelted in Tsumeb comes from that mine, since Bulgarian laws have forbidden the highly polluting process. The rest of the treated copper comes from Peruvian, Chilean and Namibian mines. The smelter's capacities were doubled with the construction of new acid and oxygen plants, achieving a new record of production for the last quarterly of the year 2016. For a long time, the smelter’s workers have been suffering diverse health issues, from skin rashes, burned faces, blindness to cancers. Their complains intensified in 2010 and drew national media’s attention. Dundee as well as the previous smelter’s owners have been unwilling to recognize their responsibility, leaving their employees with no help for covering their health related costs, and not renewing their contracts in case of lethal diseases. After the workers’ and Tsumeb residents’ strong demands, the government finally commissioned an audit on the smelter’s environmental and health impacts in 2012. The investigation confirmed the smelter’s negative impacts on the workers, the community and the environment. Still the government affirmed such results did not require to close the smelter. At least DPM was requested to do technological improvements in order to mitigate these effects. A sulphuric acid plant built in 2011 now captures up to 98% of the smelter’s sulphur dioxide emissions. Several studies were carried out in collaboration with the United Nations Development Program. Bankwatch reminds that the government has refused to render publicly available the Environmental Impact Assessment from 2013 and the Environmental Clearance Certificate for the smelter, violating the Environmental Management Act. Between March and June 2013, the Ministry of Health conducted an occupational health assessment of NCS’ former and actual employees. The investigation assessed high levels of arsenic concentrations in workers’ blood and urine. Even though the government proclaimed workers affected by arsenic absorption would be provided the required treatments, EJOs denounce DPM’s persistent refusal to properly compensate their workers so they can access appropriate medication. The smelter’s has doubled its capacities since 2010 so its current environmental impacts are ignored. Indignated civil society organizations denounce that the smelter has been financed by European public money, since the European Bank of Reconstruction and Development has granted credits to DPM for the treatment of the copper it processes in NCS (see project description). Specific Commodities Smelting of concentrated copper to produce blister copper, sulphuric acid and arsenic trioxide. Project Details Tsumeb Smelter Complex was built between 1961-62. There was both a copper and lead smelter. It became operational in 1963 under the license for Tsumeb Corporation Limited, controlled by a partnership between the Canadian Newmont Mining and the American Mining company. Successive foreign companies became owners of the smelter. In 1988, Gold Fields South Africa (GFSA) takes over the smelter. The lead smelter stopped functionning by 1994. 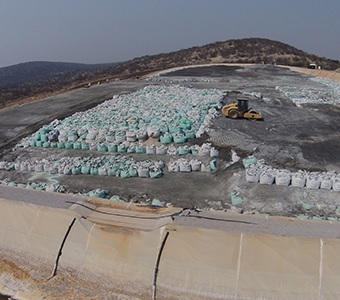 GFSA's smelter and its surrounding mines were bought by Ongopolo Mining and Processing Limited (OMPL) in 2000. For a short period of time, the smelter also belonged to Weatherly Mining International. Tsumeb smelter is one of the few in the world to treat concentrate copper from which it produces blister copper, sulphuric acid and arsenic trioxide. The blister copper is processed to copper metal in European and Asian refineries, the arsenic trioxide is sold worldwide for wood treatment and pesticide chemicals production. In 2010, the smelter was aquired by Dundee Precious Metals (DPM). The terms of the transaction granted DPM with no accountability for the smelter's previous impacts under the former owners. The Canadian company received money from the European Bank of Reconstruction and Development in 2012 to increase the ore recovery of its mine Chelopech, in Bulgarian. Half of the copper smelted in Tsumeb comes from that mine, since Bulgarian laws have forbidden the highly polluting process. The rest of the treated copper comes from Peruvian, Chilean and Namibian mines. The smelter's capacities were doubled with the construction of new acid and oxygen plants, achieving a new record of production for the last quarterly of the year 2016. Other High concentration of arsenic in urine's samples (Bankwatch), poor health and work conditions for the smelter's employees exposed to inhalable arsenic (suffering from skin rashes, hearing loss, cancer, blindness, and burned faces and sulphur dioxide (SO2) symptoms). The EIA from 2013 was never published, EJOs doubt it has ever existed, Technical improvements of the smelter to reduce impacts were coupled with the doubling of its capacities of production. -The goverment should impose a public management constraining DPM to adequately dispose of the arsenic waste. Alarming: the arsenic dumping site is running out of its capacity. Why? Explain briefly. Scarce information available on the smelter’s various consequences. For instance, DPM does not even communicate to the workers the results of their own bi-annual medical tests. All data from the smelter’s activity are given by DPM, no independent sources of information. Report from 2016 estimates the annual production of arsenic trioxide of more than 10.000 tons, DPM says it is of 4.200 tons. Arsenic trioxide continues being cumulated with no protective measures for the population and the surrounding environment. Workers continue to be inadequately compensated when their health and lives are put under threat.